With a solar panel on your motorhome you can explore some far-flung places without having to plug into an electric hook-up. Once you’ve made that initial investment, then you can get the power you need from the sun. Now the days are getting longer and there’s more sunlight up above, we’d like to know if you have a solar panel on your motorhome? Simply choose from the options below. Do you use a solar panel on your motorhome? We’ll report back the results in May. 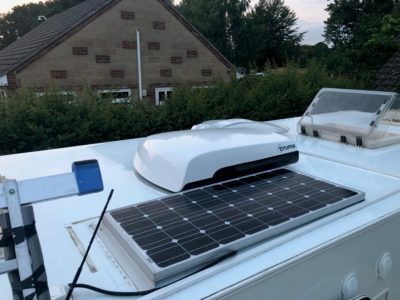 And if you fancy solar powered energy when on your motorhome travels check out our gear guide on caravan and motorhome solar panels. What’s your pet hate when caravanning or motorhoming? Do you check your caravan or motorhome tyres before every trip? Poll: How often do you clean your motorhome roof? Poll: Do you use your caravan washroom? We have a 150w solar panel on our vehicle, never had a problem with the leisure battery being less than 100%. We do not bother connecting to the mains at home even when we are initially charging the fridge. A worthwhile investment. We use a solar panel on our caravan. we tend to stay in fields and on sites that probably only have a water tap and a drain for the disposal of unwanted waste matter. The battery is kept topped up and its also nice to be able to not worry if the battery is going to be run down over what can sometimes be a three/four week stay. To date we have not had any problems and its put to good use for charging phones, tablets, TV and even a laptop and also running the caravan pump, lights, etc. Gas is used for the fridge and cooking. I would always recommend having a solar panel fitted. Love the flexibility of our solar panel to provide energy mainly because the motorhome has to be kept in storage. So without the panel the battery would suffer as we found out in the past. It’s great to see this idea becoming more widespread and in the long run will avoid a lot of holiday disappointments!